Journalist and public relations consultant, Lekan Fatodu has secured an order of court for substituted service of a defamation lawsuit against Sowore Omoyele, publisher of Saharareporters. In a court document with suit no: ID/ADR/492/2017 a High Court of Lagos State granted an order that the lawsuit against Sowore and two other defendants should be pasted "on the entrance to the 1st, 2nd and 3rd Defendants being their last known address situated and known as 46B Adekunle Fajuyi way, GRA, Ikeja, Lagos state". Fatodu stated that application for the court order became necessary after several failed attempts to serve Sowore at 46B Adekunle Fajuyi way, GRA Ikeja, Lagos State, the address the Saharareporters founder provided to the Corporate Affairs Commission (CAC) as his business address, as the gateman at the property claimed the publisher had moved out of the building. "It’s really shameful that a self-appointed apostle of probity like Sowore Omoyele will be employing cunning means to evade justice," Fatodu said. "This same address, 46B Adekunle Fajuyi way, GRA, Ikeja Lagos State, is the address submitted to Corporate Affairs Commission (CAC) by Sowore as his official address and the same address given to MacArthur Foundation by Sowore to secure funding for his blackmailing enterprise. "Now Sowore has abandoned the property thinking that he will hide from the long arms of the law. I was compelled to procure this court order against Sowore to bring him to justice after several attempts to serve him the defamation lawsuit failed as I suspected he had told the gateman met at the address to lie that he had moved out of the property". Fatodu further stated that his determination to pursue the case is premised on the need to fight corruption on all sides in Nigeria. "The greatest mistake we will be making as a nation is to focus our fight against corruption only on politicians forgetting the fact that those politicians didn’t drop from heaven. They all emerged from different areas of our lives before stepping into politics. Therefore we should start to fight corrupt online publishers, bankers, doctors, lecturers etc before they move into political circle where it is more difficult to bring them to justice for their despicable conducts. "Like I’ve said many times, Sowore and I have been friends for over 20 years. Nonetheless we must ensure that we live up to the highest of standards we always demand from others. 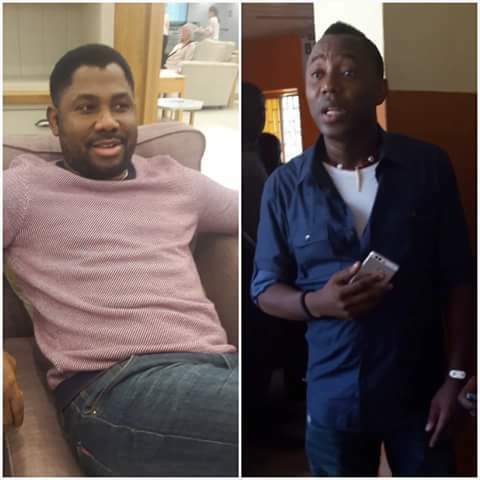 "I’m obviously not the first friend Sowore will maliciously blackmail and attack. He once did it to Barrister Festus Keyamo SAN, who is a good brother and friend of mine. Sowore only later warmed up to Keyamo as the dogged human rights advocate was ready to expose him. He also did it to Idowu Daramola, I will definitely speak more on that at a later date. "But I’m first to get Sowore arrested and drag him to court. And I’m certain this case will be a valuable resource, reference and lesson for digital media practitioners and students of mass communication on ethical and responsible online publishing. Recall that Fatodu got Sowore arrested in January 2017 for threatening his life, criminal defamation and blackmail. And he later filed a N100 million defamation suit against the saharareporters publisher.